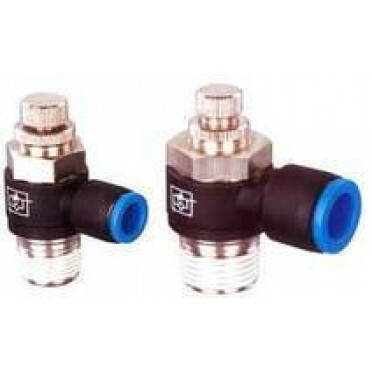 • These valves allow controlled flow of air in one direction and free flow in the other direction. • These are available in two versions - a) Supply control version, and b) Exhaust control version. Application : These valves are used to control the speed of piston in a pneumatic cylinder. Features :In line mountingLow cracking and closing pressureBubble tight elastomer seat Operation : T.. Features :Ball type, In line mountingEasy and smooth operationAssembly on rigid pipe systemMaintenan.. Features :3/2, 5/2, 5/3 valvesSuitable for manifold mountingMounting provision for individual unitCo..